“Ragnarok” (as the Marvel Cinematic Universe has briefed the world) is the end of all things. As Bjorn, Hvitserk, and Harald’s new ally King Olaf relates by firelight on the eve of their assault on Ivar’s heavily fortified Kattegat, it’s a cataclysm unparalleled. The gods die, Midgard and Asgard both burn, and all manner of atrocities tear all of humanity to pieces. “The worlds will burn and the gods will die,” intones Olaf at the end of his prediction that this battle of the sons of Ragnar will bring about their world’s—the world’s—ultimate destruction. As it turns out, the Ragnarok of “Ragnarok” is a more modest affair. As with much of what’s happened on Vikings this season, it’s up to us to determine whether that’s part of the series’ intention. When the battle for Kattegat comes, it’s as impressively mounted as ever—Vikings has never stinted on fight choreography, stunts, extras, period construction (and destruction), blood, and fire. 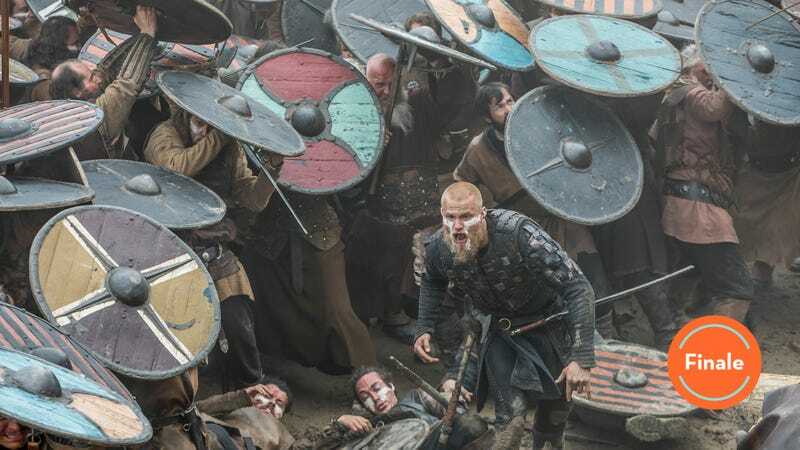 Ivar has—if we can just lay out the not-subtle parallel Vikings has been hammering all season—built his wall, and the combined forces of his brothers, Harald, and Olaf ultimately smash themselves futilely against it. It’s here that the question is raised about how intentional an anticlimax this final conflict between the sons of Ragnar is on Michael Hirst’s part. Because it is an anticlimax. As much screen time as it takes up in this season five finale, and for all the flaming oil, flaming arrows, straight-up arrows, shield walls (sorry, SHIELD WALLS! ), and mucky, gory derring-do “Ragnarok” invests in this sequence, there’s a wheeze of effort all around. Bjorn spends the entirety of his assault on one of Ivar’s gates ineffectually pounding away with a rolling battering ram. Hvitserk and Harald manage to scale the walls on their side (thanks to some nifty pole-hoisting audacity), only to be turned back unceremoniously outside in the mud among the mounting bodies of their men. Olaf the Stout—carried aloft in a litter through the thronging warriors as arrows rain down around them—rants, in apocalyptically unhelpful prose, “Come and see the death of humanity upon a shore of corpses!” Ivar, secure in his perch atop his spike-studded fortifications, laughs and roars in glee as his archers slay at will, and a nasty but impractical looking bellows contraption he’d devised fans the flames already engulfing the oil-drenched invaders. Maybe it’s just that we’ve been spoiled by the many inventively schemed and sprung raids of the past. Or, perhaps, Olaf’s messianic bluster is meant to underscore how unimpressively grimy this internecine warfare amongst the sons of a great man was destined to be all along. When Ivar springs his falling-portcullis snare, trapping Bjorn and the small number of warriors who’ve finally managed to batter down that one gate, it’s an unimaginative gambit on both sides, and Bjorn manages (with the bold Gunnhild’s help) to bust his way over the wall and back outside again. It certainly pales in comparison to Ragnar’s assault on Paris, for example. But, again, it seems to fit as the culmination of this season’s murky sibling warfare. When Olaf spins the oft-told tale of Ragnarok with the spellbound intensity of the true believer, none of his audience are impressed. Bjorn and Gunnhild seem to take the childhood tale as playful, pre-coital pillow talk, while Harald sneers, “It’s only a story.” “Stories are all we have,” responds the wizened Olaf. Stories are, indeed, how the driven characters of Vikings define themselves. (They’re hardly alone in that, from a cultural sense.) But, as Ragnar sensed in his own rise to glory and power, stories change. We choose narratives that reveal who we are as we seek what we want, and discard those that don’t. For Ragnar, the old stories became insufficient as he cast his eyes across the water in search of things beyond what he’d been told were all-important, so he became his own. Now his sons all find themselves living in that story, even as they struggle to carve out their own. Poor, discarded Magnus, joining two brothers in an assault on a third he’s never met, once more waffles under fire, praying to the Christian god in mortal panic before, upon being rescued by Harald, proclaiming that he has finally discovered his true heritage as a Viking—and a son of Ragnar Lothbrok. “Odin is with me!,” he exclaims passionately to Harald, “I’m Ragnar’s son! You cannot kill me! I didn’t know who I was until right now!” When one of the arrows shot by Ivar’s men finds him just then, his death would play like a sick joke if it weren’t clear that, for this possible heir of Ragnar Lothbrok, there’s no more wished-for end than proclaiming his faith and—he is no doubt sure—heading to meet his father in Valhalla. For Magnus, it’s a story with a most satisfactory end. For the other sons of Ragnar, the story plays out with the lack of resolution their scattered and conflicting legacies require. Ivar is defeated thanks to his own villainy and a deus ex machina. If the (again, unsubtle) nationalistic, isolationist “build the wall” rhetoric of Ivar the Boneless appears to hold in the face of his brothers’ ineffectual attack, Ivar the god proves to have dug under his own fortifications. Fear inspires loyalty as long as there are no alternatives, so, once Bjorn—bloodied and alone as his men retreat from Kattegat—roars to the people he grew up amongst that it’s he, and not Ivar, who cares about them, and about Ragnar’s dreams for them, no one can raise a bow to shoot him down. (Ivar tries.) Ivar (one more time: not subtle) attempts to rally the people by claiming that he, and only he, cares for “the ordinary folk of Kattegat,” while merely demanding “absolute loyalty.” For his pains (and for what he did to poor, crippled infant Baldur), his wife Freydis betrays him, showing Bjorn and Hvitserk the secret escape route Ivar had built into the city. Ivar, trying to prop up the narrative that he—and only he among the sons of Ragnar—was the gods’ favorite, kills Freydis, leaves her for the triumphant Bjorn and Hvitserk to find beside Baldur’s tiny bones, and flees in disguise on the back of a horse cart. Power is always dangerous. It attracts the worst and corrupts the best. Power is only given to those who are prepared to lower themselves to pick it up. Since it’s a vision, the dead Seer turns up, too, telling Bjorn, “Here is the story of the world. Make what use of it you can.” For the new King of Kattegat, sitting alone overlooking the city with his father’s sword on his knees and his father’s voice echoing in his head, the perspective offers little enlightenment as to what shape his—and Vikings’—story will take next. “Is any of this real?” muses Bjorn Ironside, gazing into a future he now has to write, whether he can imagine it or not. 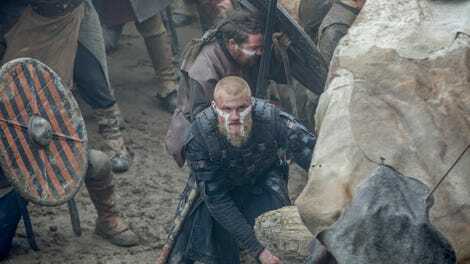 As for Hvitserk, while he acquits himself well in the battle (having apparently ditched his flirtation with Buddhism along with the figurine he leaves in the dirt), he’s left to avert his eyes from Ubbe when his brother arrives to congratulate Bjorn. The reluctant Bjorn-Harold bromance continues satisfyingly, as they share a man-hug after Harald—with a significant glance at Gunnhild—saves Bjorn’s life. They do, after Bjorn confesses that he’s been a poor father to the children he already has. He really has. We see no sign of Floki, presumably still buried under a mountain beside an ancient Christian cross. And that’s a wrap on the A.V. Club’s coverage of Vikings, season five. It has been, as ever, a pleasure and an honor. Until next time: SHIELD WALL!